Share "Prepare for Winter with Firewood"
Gas Chainsaw – for those big jobs where you need to cut large branches, down trees, or simply section the tree up. These are also ideal for small jobs that don’t have a power source. Electric Chainsaw – if you have a smaller job and a power source an electric chainsaw may be the ticket. They are quieter and don’t require fuel, plus they are easier to handle because of their light weight. Pole Saw – If you want to remove or trim branches before you down a tree this is what you’ll need. A pole saw will remove those branches that could tangle a tree up as it falls, making things safer and more predictable. Wood Chipper – Remove all of the brush associated with cutting up a tree easily and quickly with a wood chipper. You can have the wood chips shoot right into a pile or even the back of a truck! Stump Grinder – If you cut down an old tree in your yard and you don’t want that stump sticking up…rent a stump grinder. You’ll be able to get that stump down below the ground without paying a tree service a lot of money! Log Splitter – Last but not least of course is the log splitter. Save your back and time by renting one! 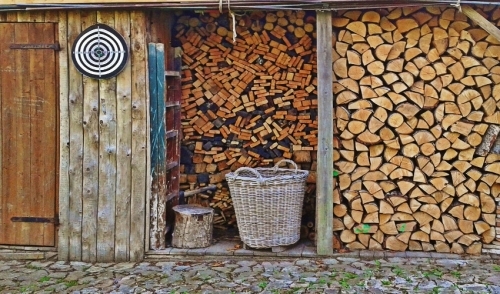 There are a couple of different choices depending on your needs – but one thing is for sure…you’ll always get uniformly split firewood.